Introducing a performance intensifier of unrivaled quality. Created by competitive lifters TO SUPPORT ELITE lifting RESULTS. DESIGNED WITH a common sense attitude that EFFECTIVE supplementation should not be OVER-complicated WITH HYPE AND BULL CRAP. REKT BRINGS QUALITY, VALUE and Results. Hype has it's place. Before a lift, at a meet, during a competition; we all like a little dose of hype as much as the next guy. A touch of hype can inspire, motivate, and help keep up the intensity when we need it most. However, hype can often be a distraction when it comes to supplementation. Too often, brands shoot for "insta-fame" through their showmanship, yet are meanwhile skimping on product quality, unnecessarily complicating the process for the athlete consumer. For those who want to focus on elite level performance in the gym, all this extraneous industry noise is little more than needless distraction. That was why Saisei Sports wanted to create a product that delivers consistent results, made of the highest grade ingredients out there, and bring it at at a value point that makes sense to the budget of those driven for advancement in strength, bodybuilding and competitive fitness pursuits. 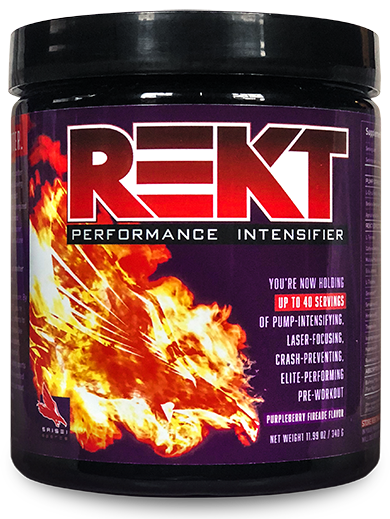 REKT is that formula, and we're proud to bring to you it's incredible potency, value and quality. Whether a first time user or a subscriber to our regular shipping option, we're certain REKT will be your go-to workout performance optimizer; a choice that simplifies your supplementation and allows you to focus on what matters most: improvement. Elite, competitive lifting builds communities. Saisei Sports seeks to strengthen and expand those communities. Powerlifters, bodybuilders, strongmen & strongwomen, and all other types of lifters create amazing communities. They are communities which inspired the Saisei Sports project, and so many of their interests are at the heart of our goals and objectives. Stay connected to the fire. Sign up here to keep up with the latest from Saisei Sports and our growing community. Thank you for subscribing! We look forward to keeping you up to date on the latest ways we hare helping you make your best even better! Changing the dialogue in bodybuilding and strength sports. Saisei Sports is proud to bring you Dirsuption, a vidcast and podcast that is making you think differently on topics that impact the world of bodybuilding and strength. Hosted by our founder, Nick Lefebvre, you’re invited to listen in and maybe think differently in regard to the real issues and topics impacting the sports your love. Events and happenings that bring you together and build your fire. Saisei: rebirth Through revision, as in recreating something via what's already there. We want you to be at your best, just reborn a little better.